Harry “The Breaker” Morant, named so for his supposed skill in breaking horses, was an Australian military officer who fought with the British Army in the Second Boer War. In his homeland, he’s often regarded as something of a folk hero—partially thanks to his embellished exploits, but largely because of his involvement in a 1902 court-martial, in which he and two other soldiers were charged, some would say sacrificially, with the unlawful execution of POWs. 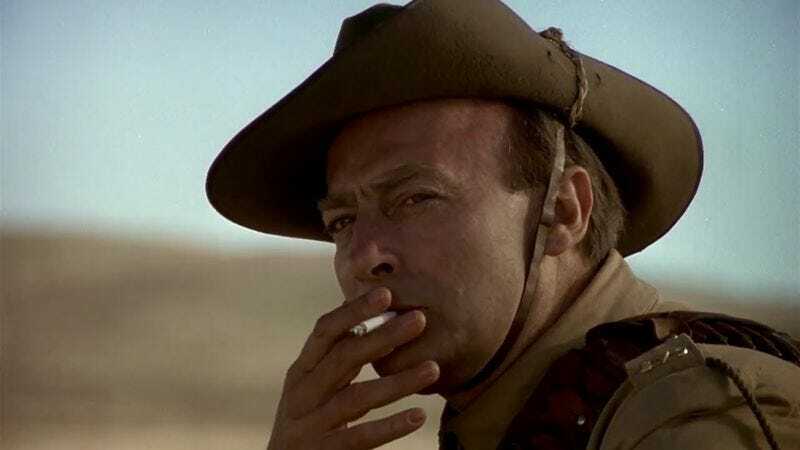 That legal situation takes center stage in Breaker Morant, an Aussie historical drama that, despite its title, is less interested in the eponymous lieutenant (Edward Woodward) than the nuances of chain of command and wartime responsibility. One could even argue that Morant isn’t the main character; just as prominent to the narrative is Major J.F. Thomas (Jack Thompson), the officer assigned to defend him. To hear many tell it, Morant’s story is one of grave injustice, in which three model soldiers obeyed directives and subsequently were made scapegoats for an empire looking to cleanly pull out of an unpopular war. Director Bruce Beresford, who went on to make Tender Mercies and Driving Miss Daisy, has always denied this interpretation, claiming that he never intended to suggest that these men were innocent of the war crimes for which they were accused. Nevertheless, it’s difficult to watch Breaker Morant and imagine that some sympathy isn’t being deliberately provoked. Thomas is given one day to prepare for the trial, while many of the key witnesses he might call for the defense have been shipped off to India. Furthermore, the flashbacks—evocative glimpses of the military campaign in question, with the Outback subbing in for South Africa—frequently reveal the discrepancy between what supposedly happened and how the higher ups framed it. Morant and his fellow accused are presented as honorable, charismatic types being steamrolled for their compliance. The British judges are blatantly biased, tossing out pertinent evidence to protect the verdict the top brass expects. In other words, if Beresford intended to make a film only about the amorality of “just following orders,” he failed: Based on the 1978 Aussie stage show Breaker Morant: A Play In Two Acts, it’s an unmistakably regional take on this infamous case, with more scorn reserved for the blame-evading, colonialist Brits than the Australians who committed murder by their command. It’s also just a fantastic courtroom drama, filled with the requisite fiery speeches the genre demands and the distinctive flavor—the crooked gallows humor, the palpable Down Under atmosphere—of Australian New Wave cinema. Availability: Breaker Morant is available on Blu-ray and DVD, which can be obtained at your local video store/library, and to rent or purchase through Amazon Instant Video. The film is also streaming on Hulu Plus.